You can affordably create Christmas gifts for employees with award certificate paper and a folder. Give each employee a different award title to truly make each gift unique. Download our Sample Employee Recognition Award Certificate Titles for ideas! Sometimes the best Christmas gifts for employees are the homemade ones. You can rarely go wrong with homemade Christmas cookies for your employees! Once you’ve made a batch (or two!) of your favorite treat, package them with festive plastic wrap, gift bags, or decorative plates. Your team will love every morsel! For more ideas, follow Baudville on Pinterest. Christmas ornaments are classic employee gifts for the holidays! Personalize each ornament with your organization’s logo and the year to make it a collectible. Send a holiday greeting card to the home of each of your employees. Add a personal note inside the cards to say thanks for their contributions or recognizing a specific achievement. Give each member of your team a Character Pin Christmas gift, and they will remember the gift for years! Carefully choose a unique pin for each member of your team based on the story. Read it out loud when you present the pins for a memorable gift presentation. The holidays are a great time to treat your team to something sweet! Fun Treat Gift Bags make excellent low-cost Christmas gifts for employees because of their delicious treats, colorful packaging, and fun sentiments. Go green this season with Christmas gifts for employees that grow! Visit a local greenhouse, nursery, or florist to consider your options. Then attach a gift tag to the plant or include a card to let your team know your appreciation for them grows every year! Encourage your team’s personal and professional growth by handing out books for this year’s Christmas gift. You can choose a different book for each person depending on their interests, or choose one gift book for everyone. That way, you can give a different one next year! Write a personal note on the inside cover, sign, and date it before you give it to your employee. If you’re looking for versatile Christmas gifts for employees, this is it! 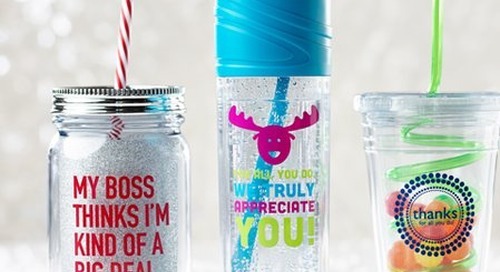 These popular Twist Top Tumblers can hold hot or cold liquid and be used year round. To make this gift more festive, fill the cup with holiday candy and a candy cane. Make a lasting impression on your employees by giving key chains for their Christmas gifts. 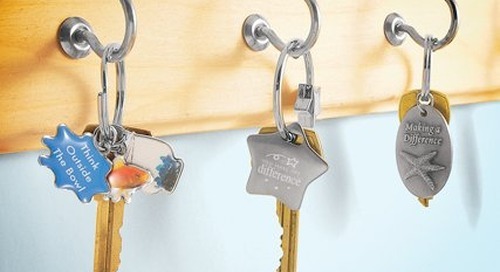 Choose a key chain from a local tourist shop to promote your community, or pick a recognition theme key chain with a corresponding character story. Share the story aloud when you present the gifts for a motivational moment! Need help navigating office gift giving etiquette? We are here to help! Make shopping for Christmas gifts for employees easy with these five ideas!